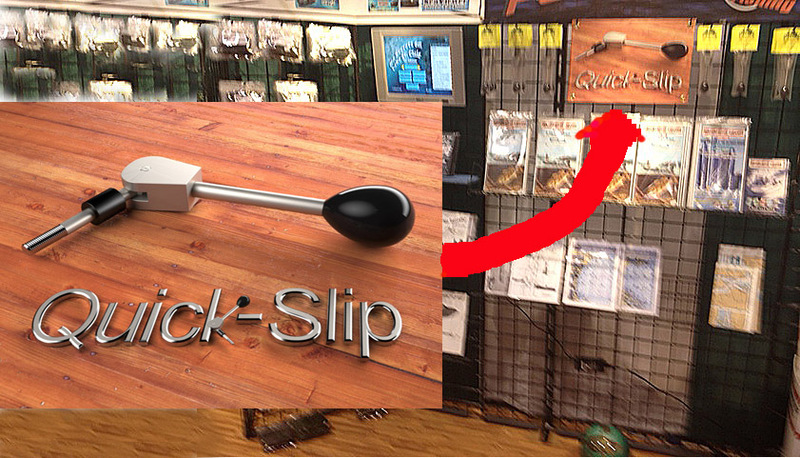 It’s that time of year and we will again be at the Ultimate Fishing Show in Novi, Michigan. See Dan Kimmel (Great Lakes Bass), Bob “Jigger” Mann and Capt. Wayne for two hours of intense bass fishing education and training. 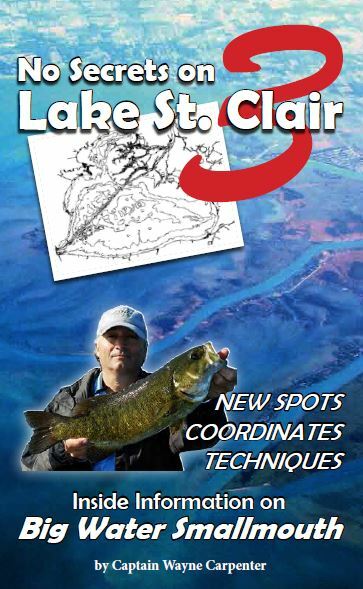 No Secrets on Lake St. Clair Seminar – Sunday 3:00pm Stage B, This exclusive seminar is only held once during this show. Come and hear about the state of bass fishing on Lake St. Clair and start putting together a plan of attack for 2016! Xtreme Bass Tackle™, Booth #2251 NEW PRODUCTS! It’s good to be back and this time around we have the products you need for a successful bass season in 2015! No Secrets on Lake St. Clair #3, new and proven tube colors, new baits styles and so much more. 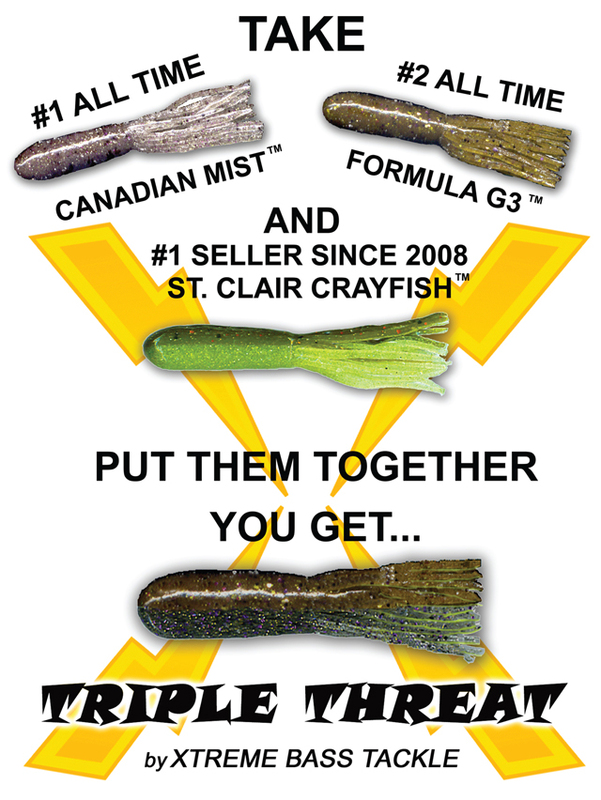 possibilities in my mind about getting a banner done for the new Xtreme Bass Tackle Triple Threat™ bait was a priority. If I just not sleep for the next 24 hours I can run here and there to get it done. Perhaps if I leave a tooth (these days a loose crown might have to do) under my pillow the tooth fairy might leave me a slick banner in its place. I still didn’t have an answer until Ryan, from Speedpro Macomb walked by my unfinished booth and asked if there were any banners that he could do for us. I’ve heard this pitch dozens of times but this time was different. The answer that I had been looking for had arrived and yes, now I will sleep tonight and keep my crown on a little longer too. We exchanged the particulars and he committed to bringing the poster(s) (Hey, might as well do two if you’re going to do one) to the show when it opened the next day. The next day he brought the banners for the new Triple Threat bait and the Erie’s Edge Quick-Slip and my booth was complete. I just want people to know about the great service, price and product that I received from the good people at Speedpro Macomb and to send you to their website where you can find out more about them. Thank you again Speedpro for helping to make the Xtreme Bass Tackle booth a success at the Ultimate Fishing Show Detroit! Canadian Mist tubes selling out at the Ultimate Fishing Show meant that some folks would have to wait for the next batch to come in. That day will be on Thursday, February 25th and through the show on that weekend. Both the sold out 4″ and drop-shot tubes will be available. Don’t forget we still have that #1 all time color in a 5″ tube, a 4″ skirted twin tail grub and negotiations are in earnest to secure a new supplier for X-worms and a deal is imminent. For over a decade Canadian Mist has proven to be a top producer on the Great Lakes and inland waters. Since launching an Ebay Store I have found this color to be the strongest and most consistent with new customers all around the country. It’s not the sale that counts, it’s the reorders. That tells you a lot about how strong a bait is fishing by how much and how fast tackle boxes need to be replenished. All baits have tendencies but few have a broad appeal like this color. Having a favorite child isn’t recommended so what’s to say about my pet designs, some of which I have poured over a year of design work into to develop and that work strong in the field? What I will say is that I love them all but Canadian Mist is the most consistent producer over all seasons, all conditions and all geographic zones it has been tried in to date. I’m often asked what is the one tube (or color) I would take out if there was only one to chose from. It would be Canadian Mist, all day long! How you decide to fish this depends entirely on the type of structure and the style of bass bite in the area. On Lake St. Clair, an open hook is fished easily around weed/sand and rock/sand combinations. This makes a round ball jighead or football head a good option both in the Lake and the river system. This is the option I use most of the time. Insert the hook point into the front (skirt side) of the bait, work it through the bait then out the body with the ball or football head resting in the middle of the skirt. A 3/0 hook is large enough but a 4/0 hook could still work. The Texas Rigged option can be very helpful should you decide to go into the weeds to extract the bass you are looking for. Smallmouth tend to cruise around structure but there have been some anglers that have taken the approach to go inside the weeds to reach fish most anglers pass up. Whether to peg the bullet weight sinker is a question that is often asked and that can depend on the individual angler and how they decide to present the bait. Since St. Clair has more “open water” structure than anything else, my tendency is to “not” peg the sinker into place. I recommend a 3/0 offset shank worm hook (with an O’shaunessy bend). There are other excellent hook choices but in my experience with this specific bait, this hook works best. Carolina Rigging is used with great success by many St. Clair anglers. I wish I could tell you more about it but I am Carolina Rig challenged. If you have confidence in it, then go with it. 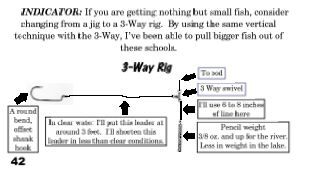 The 3-way rig is one of my favorites and one that I have worked hard to perfect for use with soft plastics. It’s dynamite in the river system and one of the most stable rigs to use in the Lake under windy conditions. A hard hookset is not needed since the fish just start to run with the bait, you feel the pressure on the line and begin to reel the fish in. I now recommend a EWG (extra wide gap) hook with this rig instead of the round bend hook. You can put all manner of plastic baits on it. 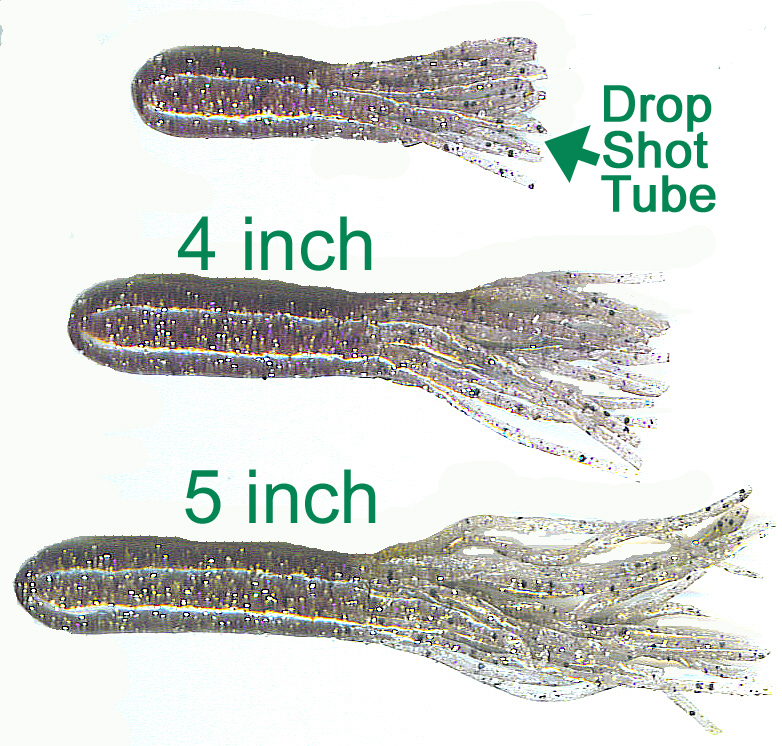 Drop-shotting this bait can be a solid option when the bass want the bait off of the bottom. I recommend heavier tackle than the standard drop-shot rig (at least 10 lb. test and a long medium action rod). It helps when using the larger style hooks like the worm style or EWG. This rig keeps the bait off of the bottom and above the sand grass or slimy algae that can jam up baits as soon as they hit the bottom with other rigs. 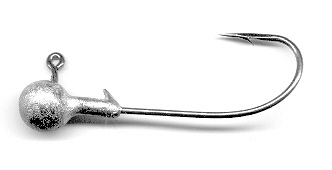 I recommend a pencil style sinker with a swivel on top, on the bottom of the drop-shot rig. A 3/8 oz. weight works great for most situations and you can trim the bottom of the pencil weight off if you need to make it lighter. Above all, confidence will catch more fish than any technical change we make. Hopefully one of these above options looks like one you like to use the most and have confidence in. 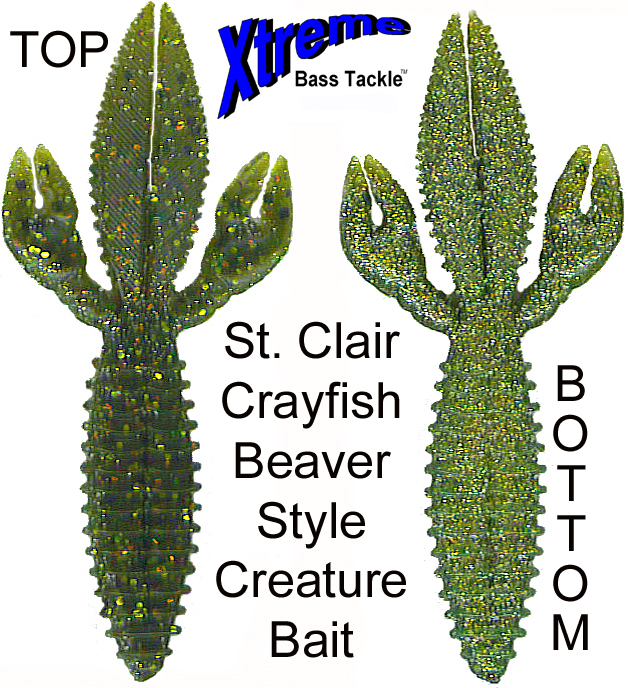 This is a first for the design world of Xtreme Bass Tackle, a creature bait produced in a signature custom color: St. Clair Crayfish. This bait was released in 2008 and has quickly become the hottest selling bait everywhere it’s fished for both smallmouth and largemouth bass. Even though this color was originally designed for smallmouth in the Great Lakes system a funny thing happened once we got it wet… Largemouth don’t just love it, they crush it. Previous to this creature bait release the color has been available in a tube bait which works well inland but largemouth anglers will immediately see the value of a Texas Rigged creature bait in the same hot color. Once a bait design is finalized it heads off to the factory and eventually the moment of truth arrives at my doorstep. The translation from what’s on paper to what’s in the plastic is always an adventure and this time around was no exception. Not only was the color matching great, the flake dispersal perfection but then…the law of unintended circumstances kicked in; It was oh so obvious that every single bait was different, like snowflakes! Now we’ve got something more like what happens in nature, variation. Now all we need is the water to soften up in our northern states and the rest of the story can be told.